BSBingo is the perfect corporate productivity tool for staying conscious during meetings you'd otherwise fall asleep in. 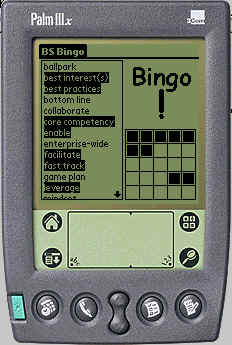 This version is for PalmOS and will eventually be rereleased as BYOBingo. Check out the Win32/WinCE version too! Rated Five Cows by Tucows! Every time someone uses one of the words in the lefthand list, you select it, which fills in a square on the bingo board. When you get bingo by filling in five squares across, down or diagonally, you stand up and yell Bingo! or Bull---- or something similar. While playing, you can tap on a square on the board to see what word goes there. You can also unselect a word from the lefthand list if you selected it by mistake. The Game/Options menu lets you choose the Bingo message (Bingo! or Bull---- - spelled out completely). You can create custom word lists for BSBingo. You can have several word lists (i.e. technical meetings, managerial, team builder...). You create these word lists as normal memos in MemoPad. The first line of the memo should start with /@-BSBingo:<title> (without the quotes), where <title> is the title of your word list (i.e. Technical, Managerial). The title line must be followed by precisely 25 lines, one word per line. You load a word list in BSBingo using Game/Load Word List. The titles appear as items in the list, with the addition of the BSBingo default word list. This release has a limit of 24 custom word lists. BSBingo is written as a personal project by Mohan Embar. He has made this program available for download on this website under the following terms and conditions. Usage of this program indicates your acceptance of the following license conditions. If you do not agree with these terms, you may not use this program. Developed in C++ using the GNU prc-tools 0.5.0. If you agree to these terms, you may download the program. Note: It is strongly recommended that you uninstall any previous version before installing the program. You can either download a zipfile or the individual files. Released under new creator ID BBNG. Released under new creator ID BSBG. Sort list in alphabetical order. Added new option to randomize board.